I love Nexus and I have a full run. It's one of my favorites. I haven't looked at the archives too much yet, though I must admit I've been thinking about getting them for ease of use versus the comics. Badger is another favorite. I went on a Starlin kick a while back and read quite a bit of Dreadstar, but kind of gave up on the post-Starlin stuff. I've come to use the word Dead Universe for many things though the years. It seems here of late that a number of 'dead universes' are being brought back to life by Marvel, DC or 'other' company out there. I think that we are seeing that among comics (and 'movies' for that matter) that were printed back in the day have pulled to them a kind of comfort feeling and in these hard times we are looking back to what made us feel comfortable, secure and happy back when you didn't have to look at the world through 'crazy eyes' like I find myself doing now. The older books always had a draw (no pun intended) to me because of what I used to read when I was much younger and I didn't have so many things on my plate, heck I didn't even HAVE a plate back then. But I have seen many remakes of older films and at first I thought, 'by God, think up your OWN cool idea for a movie/comic like I had back when I was a kid' but now I see it as a trend of the past trying to be linked and comforting in the today. I look back and have fond memories of books, movies, 'things' and it makes me feel good. It makes me want to go back to times like 'that', back 'then'. With new movies like the 'new' Tron movie due out here soon... yep, it is an old idea but an idea that I thought was wicked cool back when I was younger and that is perhaps why we see a return to old ideas. This can be good and it can be bad because seeing old movies redone and books brought back (Red Circle, Atlas, *even Crossgen feels old now but Marvel looks like it may have a future for this DU* as well as Magnus/Solar from Dark Horse) many times can leave you disappointed because it was 'not how it used to be'... and well, that is because IT'S NOT !!! I don't think things can hold a candle to your fondest memories and capturing that magic that was... but I can surely see things in a new light. Yes, I use Dead Universe for many things and I have not detailed it down (for me) exactly what it means, but one thing is for sure... I am glad for a Dead Universe section in which I can go talk about these things with like-minded individuals without ridicule as I have experienced in the past. 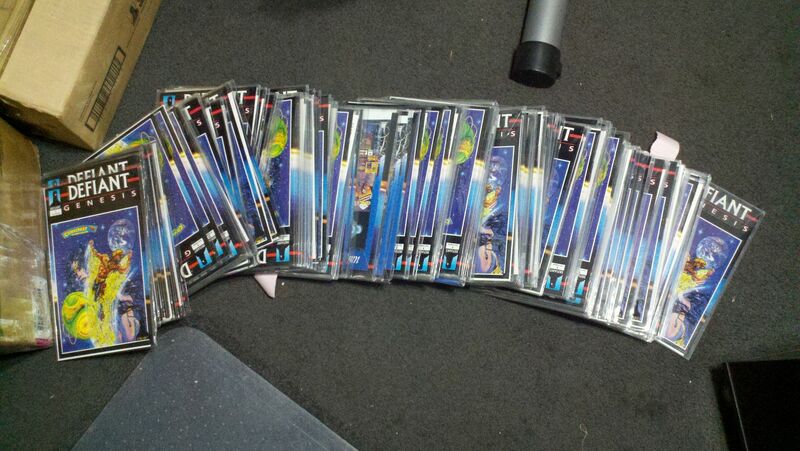 I've gotten that 'you collect Ultraverse ?' eye roll before but I think that others have found that something as easy as the Ultraverse is a pretty good thing after all. That's a great post, Knightt. Very insightful. I think that's part of what's drawing me back to Valiant, Defiant and the like, because it also reminds me of a time when I "didn't even have a plate" either. I received a very nice 'set' of gold books (from Image) and then a couple more only two days ago from some very cool DU members (again, allowing me that fantastic ability to 'pay it forward'... not that I require a something to actuate a pay it forward response but it is nice to see that the Comic Karma creed is very alive and well here in the DU). It is GREAT to see these books come into and leave my collection. I wonder why we do not see these kind of books TODAY ? I do not mean these DU books but rather why don't we see something like the Gold Books that were dealer incentives back in the day ? Or am I missing something here ? I remember seeing in my first LCS back at Fort Bragg, NC (The Dragon's Lair with the coolest owner ever named Bernie... him and I did Amway back then as well, it didn't work out for me but I loved the products when I could afford them, I was a very young Staff Sergeant) a copy of WildCATs #1 Gold Cover signed by Jim Lee. I was BLOWN away when I saw this and felt the same way when I saw the price tag. LOL It became my Quest Book and is my most treasured Hoard Book (I believe that I now own one signed book and three or four unsigned) to this day. I do not see any books like this or the other Gold Books like Supreme or Wildstar (stop laughing, ) in today's market. Look at the love many of us have for the Valiant Gold Books. While not as flashy as some of the Image books, many of them are coveted by us collectors. Why do we not see these in today's comic book market ? Are they too expensive to produce ? Is printing a variant cover cheaper ? I am very anti-variant (but fall prey to them with the Dark Horse Gold Key books) when it comes to the 'standard' Marvel or DC variant covers but I 'might' like them if the incentives were ULTRA cool covers. I know that I have bought the old Image Gold Books time and time again for $1.00 a piece (and Valiants for even less) but I still REALLY dig them. I also dig the Comics Greatest World incentive books. You slap some holofoil on a piece of dog stool and I will buy as many 'copies' as I can, dude !!! So, what are we not seeing these really snazzy incentive copies today ? A gimmick only lasts so long before it becomes a joke. And all the foil and things have become a huge joke in the comics world, I think thats one of the main reasons they've died out. I am pretty sure that the first Image gold book was a reprint. It was the first Youngblood 1 and it was the second print because that was the way Marvel did it and Image has never been one for thinking outside the box. I do have a copy of that one. I only have a couple of the other Image golds. I've got a Supreme 1 and a Youngblood (second series) 1. I may even have a Wildstar. I don't know what they were. I just figured those were incentive books. Bro J probably knows. You've got it right, as far as I know. There was a gold logo Youngblood #0 which was also an incentive. I didn't really know much about Youngblood having a Vol.2 in 1998 at Liefeld's Awesome Entertainment. Looking at Mile High's page for this title, it looks like there might be as many as three different gold versions of #1, along with a silver logo book. Talk about overkill! Youngblood (V1) #1 had multiple cover COLOR variants (to include the flip covers as well), but not a gold foil. Though the 2nd print did have a gold border around the cover to include the flip cover. Youngblood (V2) never had a gold cover for any of their issues, but multiple variants. Youngblood (V3/Awesome) #1 did have a gold cover - in fact there were 11 different covers for #1! The whole idea of Gold books was always a problem back in the day, mainly because it coincided with retailer, publisher greed. So what started as a snazzy idea was bastarsized immediately and it all went horribly wrong. The mere mention of it from the old days still irks me, but much like Knightt i love those babies from the cheap bins, in fact the last year i have so enjoyed buying any old school premium or variant for 50p or £1.00. So it's a strange topic for me as some of you know i have ranted so heavily about the recent slew of incentive variants from say the last 5 years. My problem now is the old school problem, people trying to rip off others, yeah i know business is business and if someone is willing to pay then take their money and all that jazz, but there are better ways to earn money in comic land, honesty decency and sharing of knowledge come to mind. I prefer the retailers who give them out to good standing customers for free or at cover or raffles etc. Trying to tout a sketch variant for £50 is bollox and never helps anyone. So yeah love the old school stuff at cheap bin prices and like some of the new covers when done well, but will always hate the BS that goes with it with some retailers. Same here. I can rant on 'variant covers' for a couple of hours because I am only a fan of them when I come by them cheaply. oops, I missed seeing the 1995 series of Youngblood when I did a search on Mile High, so I assumed the 1998 series was Vol.2, not Vol.3. To be honest, I don't know much about Youngblood, because I really don't give a $hit, always thought it was trash. I have quite a few Dead Universe runs. Im not really a collector of Dead Universe I just like a lot of the series in them. I have full runs of Airboy (Eclipse), Elementals, Dreadstar etc. I really love 80s indy books. Welcome to the Dead Universes then dude. So, you are a 'closet DU monger' ? You may just be in denial. Probably. Im such a completist if I start buying books from a particular DU ill want everything. I really love 80s indies though. The stories are great. I really love 80s indies though. Same here. I now have a short box of them as well as a few 90s era indie books. I mean the 90s stuff is really Image knock-offs but at least the stories are about 3-5 books... well ok, the whole run is 3-5 books. I'm a member of this prestigious type of collector. I buy some current comics in TPB but otherwise the only comics I actually buy are all dead universes. So.... since the first post was years ago hows that secret handshake coming? ...and I am a Valiantoholic. If you shake it more than twice, you are playing with yourself. I'm really, really excited to have found this forum. I'm a HUGE fan of Dead Universes, and it's awesome to find a community to share that love with. 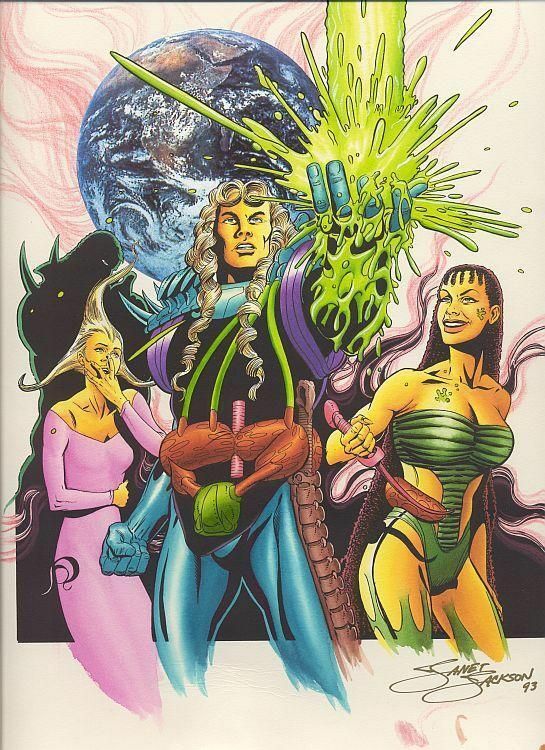 My biggest love is Ultraverse. I'm not only collecting all of the variants, but I'm trying to create reading order lists so that I can bind each title into its own hardcover. 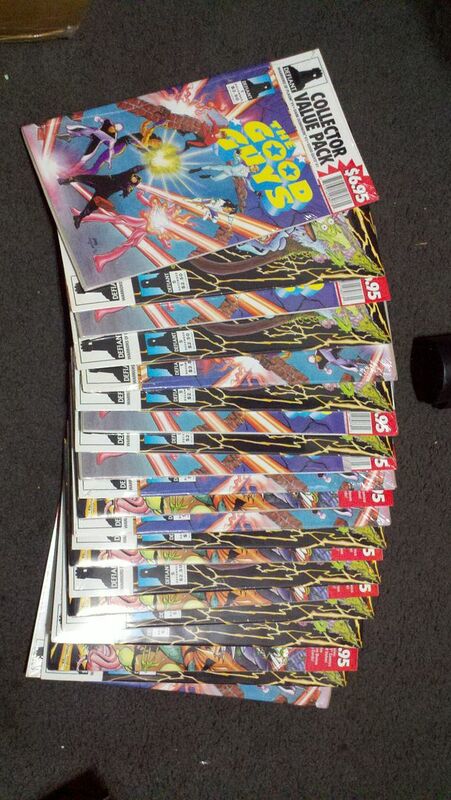 This means that I own 12 copies of each issue of Break-Thru, btw. I have tons of checklists I put together myself, and I can't wait to start cross referencing them with what I find here. Welcome to our little nuthouse, jason. Do you have a Break Thru 1 Ultra 5000? We always hear about the scarcity of that book but several of us here have them.